Will you be traveling from the east to Columbia Missouri for the Missouri State Genealogical Association (MoSGA) annual conference on August 1 - 2, 2014? I'm sure I don't have to tell you the setting for this photo (courtesy of the Missouri State Archives). Columbia is in the center of Missouri with St. Louis just 2 hours to the east. If you are driving west on I-70, stopping at St. Louis for a day makes sense. You can visit the iconic Gateway Arch and if you are brave enough ride to the top (count me OUT) for an amazing view. You may prefer to stay more grounded and visit the Museum of Westward Expansion then take a stroll along the river. Taking time to visit the Missouri History Museum needs to be on your itinerary as well. During this time frame you can visit their special exhibit American Spirits: The Rise and Fall of Prohibition. 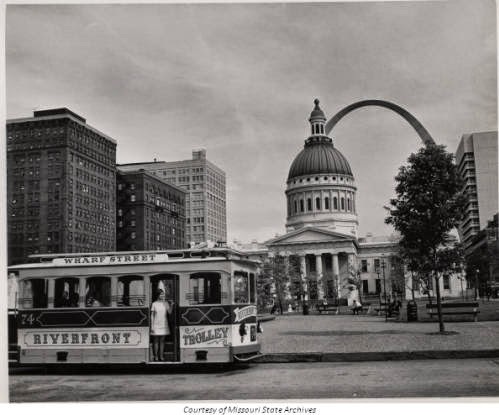 The National Personnel Records Center is also located in St. Louis, if you need to do a little military research while you are in the neighborhood.